On our recent study trip to Bordeaux, my class had the pleasure of visiting the prestigious producer of Sauternes, Château d’Yquem. In fact, prestigious may not be a strong enough word, as Château d’Yquem is the only domaine in Sauternes classified as “Premier Cru Supérieur” in the Bordeaux wine classification of 1855 (the system which continues to dictate the classification today, more than 150 years later). They are also the only producer of Sauternes who do not produce a second label, a sort of all-or-nothing approach that means that years of less-than-ideal weather conditions, they simply do not produce their wine, as they would otherwise risk declassification. And in fact, 2012 was just horrible enough that we will never see a bottle of the precious golden liquid from this vintage. They will still produce the wine (though the putrid conditions this year left them with only 216 barrels, as compared with about 900 in 2011) but it will be sold to négociants (wine traders who buy bulk wine, blend it, and then put their own labels on), who are forbidden from putting the name Château d’Yquem anywhere near the finished product. So the 2012 Château d’Yquem will be lost in the shuffle of 2012 Sauternes, cleverly disguised so as not to tarnish the reputation of the esteemed château. But despite its lack of existence this year, the meticulous process for making Château d’Yquem remains astounding. Their nearly 40 year-round vineyard employees (17 of whom are women) are each responsible, year in and year out, for performing a series of 50 pruning maneuvers on the same parcel. This way each worker develops a rapport with the plot, and can provide the most comprehensive, fastidious care possible. All of this in preparation for the harvest season, which can only commence after the appearance of the illustrious noble rot (botrytis cinerea), which requires very particular weather conditions (foggy, moist mornings and bright, clear afternoons) and results in a beautiful dehydration and concentration of the grapes (of which 80% are semillon and 20% are sauvignon blanc). 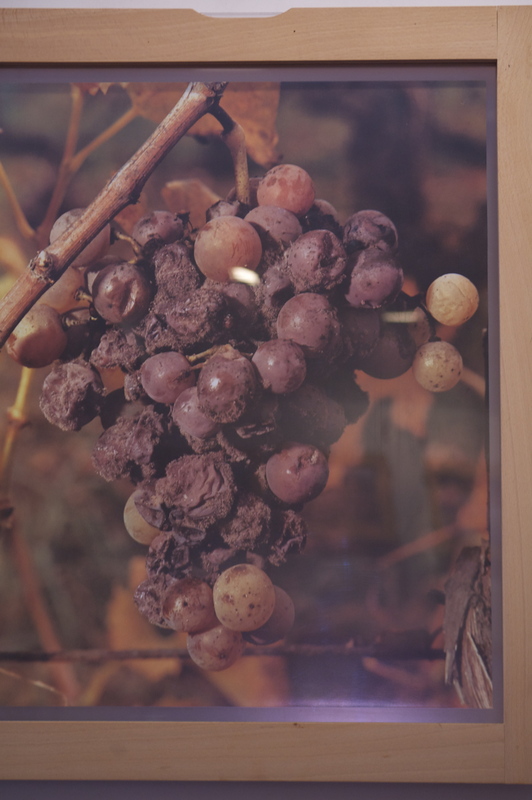 These botyrized grapes are harvested in a series of passes through the vineyard (which could occur over a period of days, weeks, or even months), first selecting only the botyrized grapes and then passing through to collect the non-affected grapes which, even still, have ripened to obtain a sugar content of 20° potential alcohol (this means that if fermented to completion, this juice could attain up to 20% alcohol – and even more for the botyrized grapes – of course this is not the intent, but rather to ferment partially with remaining sugar at the end). Furthermore, at each pass through the vineyard, there is a triple selection, grape by grape. First by the harvester him- or herself, then when the small collection baskets are transferred into larger bins for transport to the winery, and finally upon arrival at the winery, just before pressing. Grapes are harvested not by parcell, but by ripeness, so on a given day the lot that is harvested could include grapes from across the property. In this way grapes from the four different soil types of Château d’Yquem, clay, sand, gravel, and limestone are assimilated into one single wine, to which the company attributes the complexity of the wine. And what does all of this borderline-obsessive TLC and terroir-mingling give in a wine? We were able to taste the 2006, which was described to us as not the greatest year, but still gives a good idea of what those of us who can’t afford a 500€ bottle of wine are missing. First impression? Eggnog! Maybe it was the coming holiday season, but when I plunged my nose in the glass before swirling the liquid gold inside, the aromas of nutmeg-y creaminess jumped right out of the chalice in my hands. But upon swirling in a bit of oxygen – the gas responsible not only for our lives, but also the lives of our wines – honey, dried apricots, figs, and even notes of tropical fruits such as mango, pineapple and passionfruit. Thanks to its well-balanced acidity, the wine enters the mouth fresh and clean, evoking more citrus-y, summer-y fruits, which evolve toward more candied versions and then are rounded out by a bit of oak on the finish. The oak isn’t overwhelming, but gently supportive, carrying the wine on its journey through the mouth as if in a basket. But is it worth the price? This will forever remain the question, and a valid one at that, for wines at this price point. Some photos of the incredible, steep slope terraces of the Côte-Roti in the Rhône Valley.